The ANA test checks the ANA blood level. The ANA blood test measures the ANA blood level. Why is an ANA lab test important? The ANA blood test checks antinuclear antibody levels to screen for autoimmune diseases. This ANA Test is a blood test. The ANA test, sometimes known as an ANA lab test, ANA blood test or antinuclear antibody test, measures the ANA blood level. Antinuclear antibodies (ANA) are proteins produce by the immune system that attach to the nucleus of a cell. Normally, the immune system produces antibodies that bind to and attack foreign invaders. However, when the normal immune processes malfunction, it can lead to the creation of proteins such as ANAs that attack the body's cells themselves. ANA testing is done to screen for these situations in which the body's immune system is not functioning properly. Examples of when this might occur include autoimmune diseases such as lupus. The ANA test is often performed in the setting of symptoms such as joint pain, weakness or fatigue, and inflammation which might identify the presence of an underlying autoimmune disease. A positive ANA blood test means that autoantibodies made by the immune system were detected in the blood. This suggests that the immune system is attacking tissues or cells in the body and warrants additional investigation with lab testing and, in most cases, the help of a medical specialist. Elevated ANA antibody titers are suspicious for inflammatory and autoimmune disorders. Most commonly, positive ANA test results are associated with conditions called SLE (systemic lupus erythematosus), scleroderma, Sjogren's syndrome and lupus induced by medication use (drug-induced). In contrast, the absence of ANA blood antibodies usually means that SLE is not present. ANA blood levels are frequently tested at the same time as other antibodies such as the anti-dsDNA test and the Sjogren's test panel. As a result, many of these lab tests are tested in more comprehensive panels like the SLE panel to provide a broader snapshot of the activity of the immune system in causing tissue damage. Getting this ANA test near you at a Quest Diagnostics lab is a straightforward process. Once you have placed your ANA order, simply visit the selected lab on the day of your test with the ANA lab testing instructions provided. Your ANA lab results will be available electronically and will include a reference range provided by the lab to help you evaluate your ANA levels. 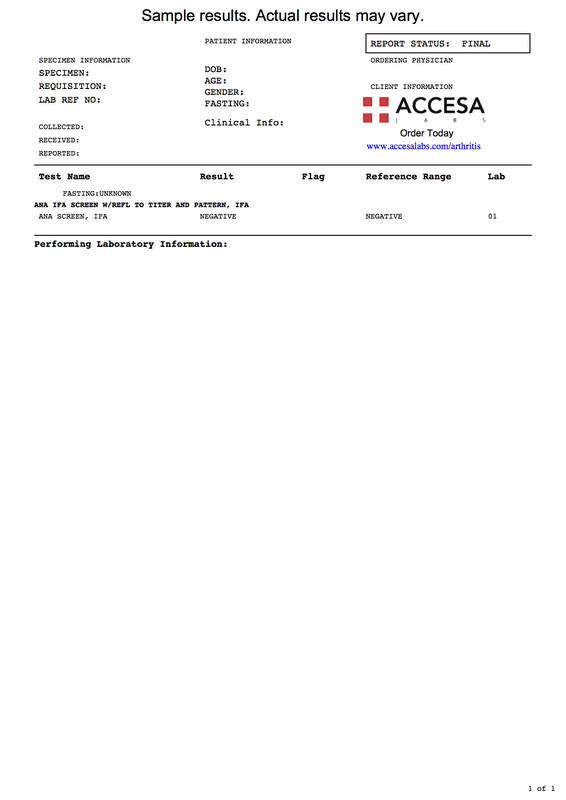 On the ANA sample report link provided above, one can see a negative result which indicates that no antinuclear antibodies were detected. In the event that the ANA blood test is positive, an ANA titer and pattern test will automatically be run at no extra charge. The ANA test can also be found as part of the more comprehensive joint pain test panel. ANA Test at Guaranteed Prices.